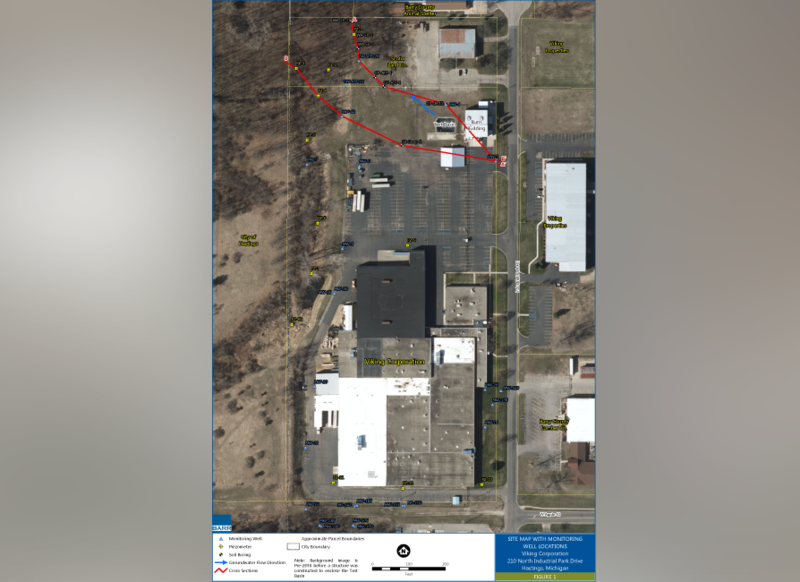 A map of monitoring well locations around the Viking Corporation plant. Tests showed an upper level of 192,000 parts per trillion for the two most common kinds of PFAS chemicals, PFOS and PFOA. The EPA's health advisory level for exposure through drinking water is 70 parts per trillion for those two kinds of PFAS chemicals combined. According to information on the Michigan PFAS Action Response Team – or MPART – website, this is one of only a few sites in the state that have found PFAS concentrations in the 100,000 parts per trillion range. Scott Dean, a Department of Environmental Quality spokesman, says there is currently no threat to residential drinking wells in the area. But Dean says the state will add additional monitoring wells near the plant to do further testing. He says the remediation plans haven’t been finalized yet.